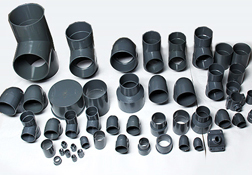 Precision Agriculture UPVC Pipe & Fittings are manufacturing from high impact unplasticised polyvinyl chloride compound that is capable of withstanding the most rigorous on-site conditions and exceeding the most stringent requirements of Indian & International standards. The product range is manufactured in accordance with Indian standards IS: 4985 / 2000. These pipes & fittings are a perfect choice for potable water supply, where ease of installation, maintenance & zero leakages are a priority.